Sceletium elevates mood and decreases anxiety, stress and tension. It also helps with post-traumatic stress disorder, social phobia, irritability and can boost libido.Sceletium tortuosum has been used by hunter-gatherers and shepherds as a mood-enhancing substance for hundreds of years and is far more effective and rapidly acting than the well-known St John’s Wort. Your mood and mental performance depend on a variety of nutrients that feed the brain, nervous system and neurotransmitters. These include vitamins B3, B6, folic acid (folate), B12 and C, zinc, magnesium, essential fatty acids, and the amino acids, tryptophan and tyrosine. A government dietary surveys also shows that a large portion of the population don’t receive the bare minimum amount recommended of these vitamins and minerals in their daily diet and that this is one of the reasons why depression is on the increase. A link between depression, insomnia, anxiety, suicide, migraines, PMS, obsessive/compulsive behavior, stress, obesity and addiction is a low level of serotonin. Serotonin depression symptoms can affect depressive disorders, bipolar disorders, anxiety and eating disorders. Women seem to have more problems than men in maintaining their serotonin levels. Women who are low in serotonin are likelier to express their anger inwardly, with depression and even suicidal behaviour. The mood-elevating action of sceletium is caused by a number of alkaloids including mesembrine, mesembrenol and tortuosamine which interact with the brain’s dopamine and serotonin receptors. 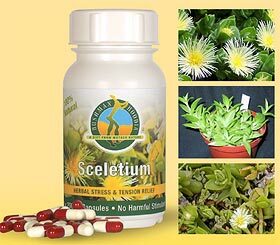 Sceletium also contains many nutrients, including minerals and amino acids.According to laboratory studies sponsored by the National Institute of Mental Health near Washington DC, its major alkaloid, mesembrine, promotes serotonin levels. Sceletium Tortuosum is a small groundcover plant native to Southern Africa. For hundreds of years the Hottentots of Southern Africa used Sceletium tortuosum as a mood enhancer, relaxant and empathogen. It is also known as Kanna or Kauwgoed, Kougoed and Canna.Historically Sceletium Tortuosum was eaten/chewed, smoked or used as snuff producing euphoria and alertness which gently fades into relaxation. If chewed in sufficient quantity, Sceletium has a mild anaesthetic effect in the mouth, much like kava. 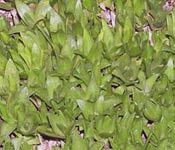 A tea made from Sceletium is sometimes used to wean alcoholics off alcohol. Although the plant has been used for thousands of years in Africa, it is only now being sought by the West for its remarkable capacities to uplift the mood, increase energy levels and concentration spans. Sceletium is also being used as a natural anti-depressant that is safer than the pharmaceutical alternatives. Kanna (sceletium) is used to re-balance the brain and nervous system and thereby relieve symptoms of depression. Combined with other well known herbs, sceletium has been proven to be extremely effective and safe. There have been no confirmed reports of drug interactions, however, because of the nero-receptor activities of Sceletium there may be interactions with other pharmacokinetic drugs.People taking any psychiatric drug (including all anti-anxiety drugs, sedatives, hypnotics, antidepressants and anti-psychotics and so-called designer or recreational drugs) or any cardiac medications, should not to take Sceletium-containing products.